It is back to regular programming after a month of Love Letters, and we are here with news from December 2015 and January 2016. There is a lot to read, so dive right in! Tamye, who is a writer, editor, and designer specializing in typography and the related arts, and served both as founding board member, and then executive director of the non-profit Society of Typographic Aficionados (SOTA), is now the Executive Director of the Association Typographique Internationale (ATypI). 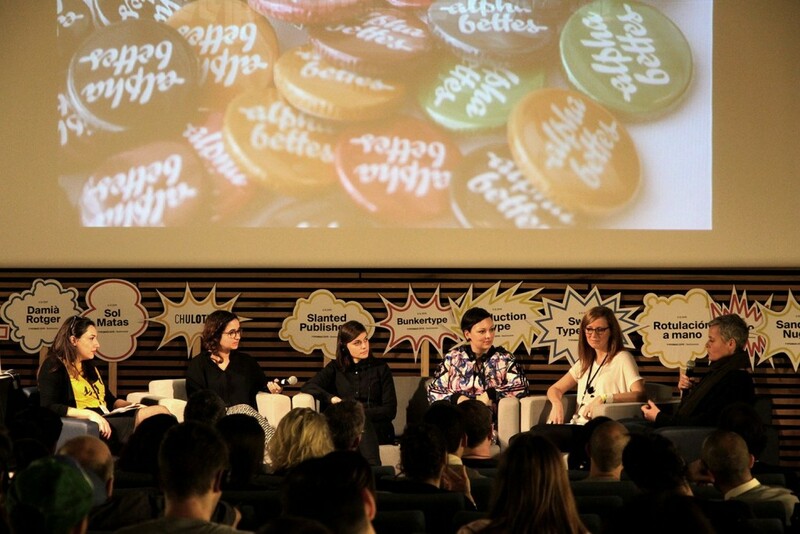 Alphabettes Sol Matas, Sandrine Nugue, Julia Kahl, Veronika Burian, and Tânia Raposo participated in a round-table discussion moderated by Nora García at TypoMad in Madrid to talk about women in the world of typeface design and Alphabettes. Read more about the type conferences in December here. (photo below by TypoMad). Prof. Nora Gummert-Hauser has been appointed Dean of the Faculty of Design at the Niederrhein University of Applied Sciences. She will head the department at least until the next election in two years time. Roxanne Gataud, who was the 2014 beneficiary of Type Together’s Typeface Publishing Incentive Programme scholarship, released her typeface, Bely, with the foundry. Read a review of the design by Isabel Urbina Peña right here on Alphabettes. Ulrike Wilhelm, Verena Gerlach, Veronika Burian, Laura Worthington, Emily Connors and Natalia Vasilyeva were all featured in the hundredth issue of Creative Characters. Robbin Schiff, Karen Welman, Julia Zeltser and Veronika Burian were judges for the TDC62 Communication and Typeface Design Competitions held last year. Welman and Burian also spoke at the TDC Judges Night 2016.